AWE Tuning Turbo Outlet Pipe - Dezod Motorsports Inc - Home of the automotive performance enthusiast since 2002. The factory turbo outlet pipe (aka pancake pipe), with its dramatic change in shape, is not optimized for airflow. Let’s fix that. With a dramatically increase in flow rate, the AWE Tuning Turbo Outlet Pipe increases turbo response – resulting in more power and a quicker turbo spool. 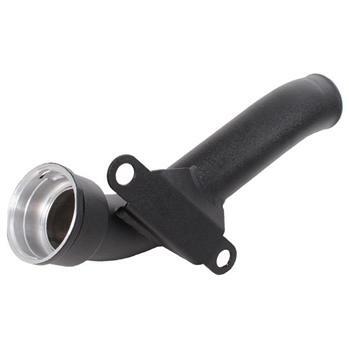 The AWE Tuning Turbo Outlet Pipe features mandrel bent all aluminum construction for unobstructed airflow and a CNC machined aluminum coupler, ensuring a perfect seal with the stock intercooler hose.